If you believe that you are more than what you seem to be. 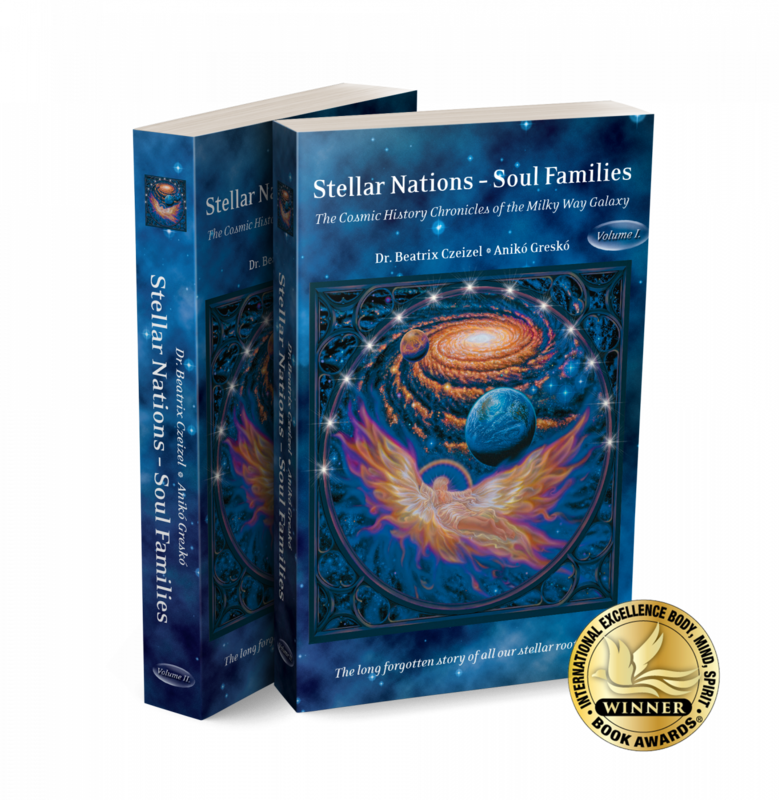 If you are looking for your stellar roots and you want to understand who you really are in your body, soul and spirit, and where all your thoughts, emotions and motivations come from, then this is definitely the book you need! You can find the real purpose of your life and the course of your destiny on this planet, and find perfect answers for most of your questions if you discover the fantastic stellar realms of the thirteen Stellar Nations that play their roles and fulfill their divine fate in the whole of Creation. This exceptionally powerful and unique teaching is a real treasure, especially because this is the very first time in human history on this Planet Earth that this 7th dimensional divine knowledge of the Galactic Akashic Records has been revealed. And what is more that you can feel the authors’ more than 23 years of spiritual work, very serious research and deep understanding as physicians, clairvoyant spiritual healers and teachers and writers of other three best-selling books behind these beautiful words and you can find real and humble hearts that are the true channels of this divine knowledge and the meanings of more than 230 stars. This book will surely change your life, and you will understand more than ever about who you really are! These wonderful books come with the color pictures of almost 80 constellations, diagrams of star positions, and it is illustrated by Philip Straub’s exceptionally expressive and mythically inspired paintings together with other famous artists.And what is more that you can feel the authors’ more than 23 years of spiritual work, very serious research and deep understanding as physicians, clairvoyant spiritual healers and teachers, and writers of other three best selling books behind these beautiful words, and you can find real and humble hearts that are the true channels of this divine knowledge. If you tried several paths but always had the feeling there must be something more all above this…. you will find it here. Every piece of your lifes puzzle will find their right place and you have the possibility to complete your whole puzzle…. When I first read it, I was almost sorry it ended. It was the most exciting one I had ever read, I could hardly put it down. Reading about the Stellar Nations: our galactic history and structure unfolded to me, and everything got crystal clear. We are human beings on this beautiful Earth, but if you are also interested in life outside our planet, or where we actually come from – this is the book for you. But its not only a book on galactic history. It is also among the best healing books I have ever read, and this is why it’s on my bedside table. While reading, I learnt about my own origins.It was easy to identify them. Sometimes only by reading I felt as if certain parts are written about my own life, and I knew immediately that I am connected to that Nation somehow. At other times – I burst out in tears during reading and my heart immediately knew. But to be sure, I could always check in my Antares-code if it is really indicated and is a relevant theme in my life. I could read the clearest personality descriptions of me I have ever read, and that was a most exciting journey inside! All my personal qualities were clearly explained, connected to my galactic roots, besides all the themes of my life. Now I know exactly why I like doing certain things, and why I am not at all interested in others; why certain things happened to me, and why others did not, and also what are the reasons behind all the challenges I have faced or am still facing in my life, or why am I successful in other areas of my life. It is so interesting! I still use it on a daily basis, when I wish to understand more deeply a certain event happening in my life. Continuously rising awareness and as a result of that, a more beautiful life is the present that is brought to us with this book and the authors. This book took me on a journey. A journey into the stars where I’ve faced magical creatures, good and bad, friends and foe. My compass was my Antares Code, and the authors were “holding my hand” all the way. At the end I’ve found my roots. The 13 Stellar Nations have helped me to understand my motifs, the returning patterns in my life and helped me to discover who I really am. This book is absolutely different to any other esoteric book I’ve ever read. It feels complete. Kudos to the authors for bringing these stories to us! I hope that more and more people will get acquainted to the Stellar Nations.